Guy Fieri takes on some of his favorite Asian flavors by land and sea. The surf: chilled soba noodles in miso dressing with seared sushi-grade tuna. The turf: Spicy Asian Fried Chicken Wings that will keep you coming back for more. The drink: Tokyo Lights, a refreshing cocktail made with sake, lime, cucumber and jalapeno. Surf's up! 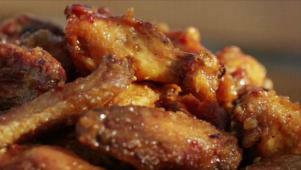 Just watch: Guy's Spicy Asian Fried Chicken Wings will fly off the plate. Guy's Tokyo Lights cocktail has big, bold flavors that refresh the palate.